A very fun textile print in a garment featured in Sonia by Sonia Rykiel Autumn/Winter 2014-2015 collection. Enjoying the warmth of this Fall's sunshine. Chesapeake Bay, Maryland. Fashion designer Donna Karan and one of her runway looks from her 2012 collection. I love the cut of the dress as well as the wonderful textile pattern! The classics of fashion - lace, pearls, and denim - never go out of style. Well, at least in my opinion. As a textile designer I have been drawn to lace for a long time. Handmade lace requires incredible skill and patience. I definitely have respect for that. In my work I am always looking for innovative ways to incorporate the traditional or the classical and make it contemporary. My latest collection of textiles turned into infinity scarves looks just into that! Even a little swatch of lace can lead to great creative adventure! For this collection, called Vision in Lace, I took two pieces of lace - one with organically shaped pattern, one with geometrically precise sections. But the white of the lace was not appealing to me. So, I took to spray painting the swatches! You can see close up of the colored laces below. As the swatches were drying, I took a lot of photos from different angles to capture the sheen and texture and changing colors. These photos would become the base for my new textile designs. I love combining hands-on work with computer magic. Indeed, there is a variety of programs one can use to alter imagery and to change its feel completely. After many tests and after reviewing many color combinations, my collections honors the popular colors of blue, green, and red. Aren't these just perfect for any occasion? As I say, lace, pearls, and denim ... They never go out of style. If you like what you see and want to be Vision in Lace, check out my online store and treat yourself! So much color! Loving textiles in this Spring/Summer 2014 Collection by Prada. Textures of the Fall. Potomac, Maryland. 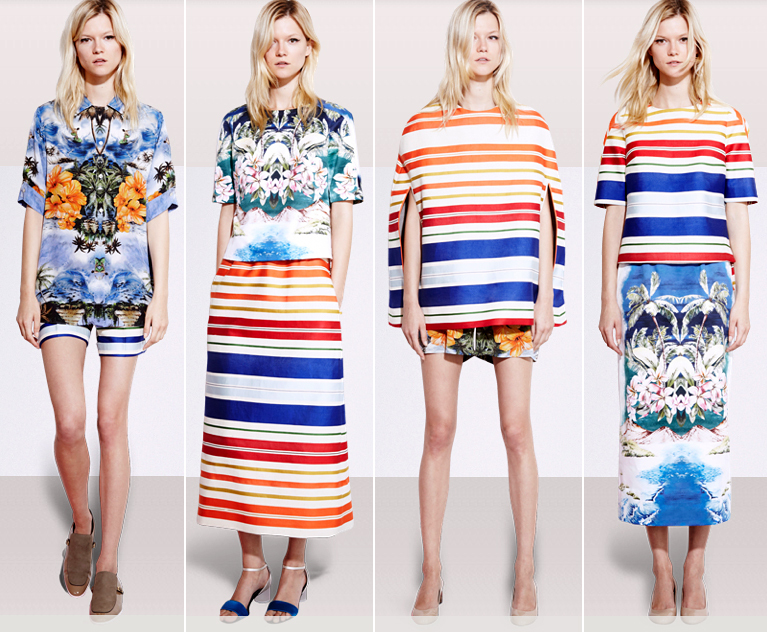 A lovely interplay of bold stripes and intricate prints in textiles used by Stella McCartney in her Spring/Summer Resort 2012 collection. Aren't these fun? Got Tons of Old T-shirts? Then, Think a New Pillow! Let's be honest. By now, you know I am obsessed with pillows. I design pillows of all shapes and colors and textures and I very much enjoy custom orders. Today, let me tell you about the biggest pillow I have designed and sewn to date! ​It turns out old t-shirts, when no longer worn, are still of value, of sentimental value. So, this recent custom project of mine is an emotional one. I took a set of jerseys and team/school t-shirts that used to be worn and turned them into a fantastic - BIG - pillow for a now college student. Isn't it the perfect addition to his dorm room? It's a fun reminder of the good in the past and the fun to be had at school and in the future. How did I create this pillow? Well, it was bit of a puzzle I tell you. I cut out the logos from the old t-shirts and lined them up to work well size- and color-wise. The pillow insert was 50" by 20" so I had tons of room to play with. I added stripes of blue fabric, the college colors, to the sides and to the back. The pillow cover can be taken off and washed easily. Et voila, proof is here! This pillow is BIG, bigger than me! What do you think? Interested in a custom pillow? Contact me. I would be excited to work with you!